Array is an effect for spectral animation. It filters the incoming audio into eight separate bands and allows you to individually pass or mute them in a rhythmical fashion, essentially working as a gate sequencer in the frequency domain. With macro controls for multiple parameters, Array is a quick yet capable tool for all kinds of spectral effects – morphed, stepped, strobed or glitched. Array displays a live audio waveform on each filter band and allows to operate on it directly, giving you a true “what you see is what you get” workflow. Every element in its user interface is color-coded and features subtle animations, bringing unusual ease of use and interactivity. Plus, all this goodness is rendered right on your Mac’s graphics adapter meaning fast response and no extra load on the main processor, regardless of how new or old your system is. – Eight -24 dB/octave filters each with its own output gate sequence. – Live audio waveforms and fluid sequencer graphics visually matched to them. – Improved parameter handling that reduces processor load. – Removed animation during sequencer timing changes. – Added vertical sequencer step markers. – Bipolar sliders are now centered around zero value. 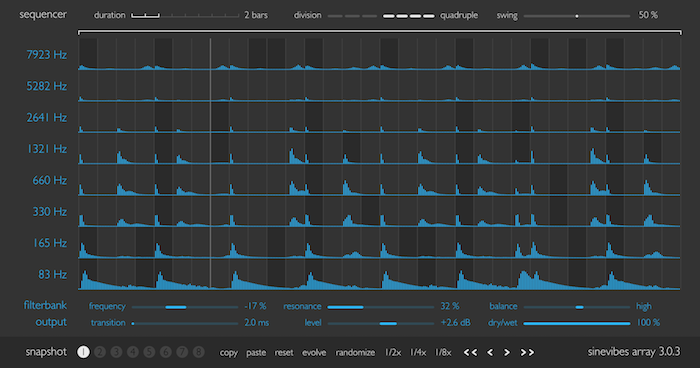 – Fixed sequencer de-synchronization during tempo automation.